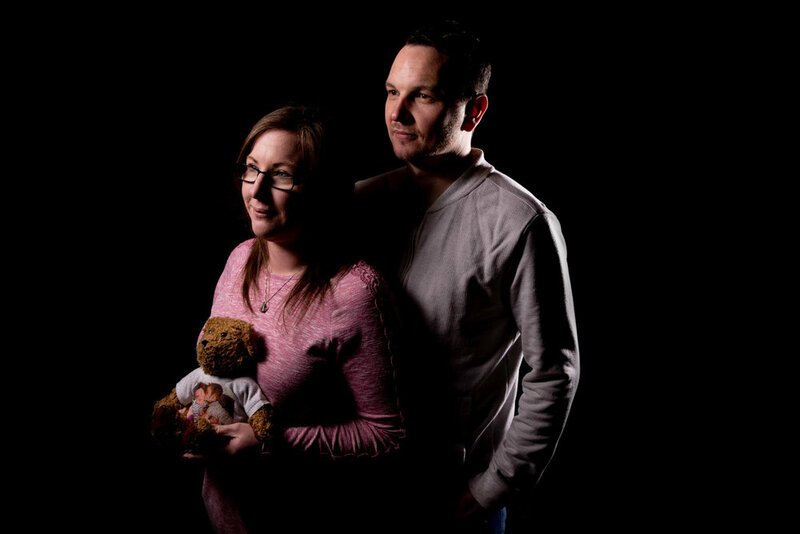 This project was designed to start the conversation about child bereavement due to rare disease and highlight the need for more support for families. Sharon and Kyle recently spoke to us about their son Ryan who had a rare disease called Ohtahara syndrome. “Ryan had his own special personality because we used to communicate with him through his different types of seizures, so he’d have a superman seizure which would be his happy one, or if he wasn’t happy with something, he’d have a flinchy seizure, so that’s how we’d communicate with him. He was just a charmer. Everyone used to fall in love with him when they saw him, and a few people commented that he let off this happy aura so if you were with him or around him, cuddling him, he just made you feel happy. I had a normal pregnancy and delivery so we did not realise anything was wrong when he was born. We had a few issues with breastfeeding, so we stayed in hospital for an extra 3 days, but nothing was picked up. It was when we got home and he was doing little waves, I just thought he was really talented, being able to wave at a couple of weeks old! We went to the doctors when he was about 6 weeks old thinking that he had an ear infection but while we were there he started having seizures. We were told it was probably because of high temperature and they transferred us to Arrowe Park where they did an MRI scan. It was at that point they realised he had brain abnormalities but we weren’t given a diagnosis and they just treated his seizures. He was in hospital for about 6-8 weeks and then we were transferred to Alder Hey to see the specialist and he got diagnosed with Ohtahara Syndrome. Ohtahara Syndrome causes significant brain damage, epilepsy and cerebral palsy and it meant that as Ryan got bigger he was still like a newborn with no head control. It took about 3 or 4 months to get the actual diagnosis and it turned out the doctor treating him had actualy written an article on the condition so they gave us a link to the website for us to read. It said that children with the syndrome would be very developmentally delayed and probably have a life expectancy of 2 years old. It took me a while to process it all because we seemed to be getting a bit more information each time we saw a GP or a consultant. At first when they said he was going to be delayed, I thought I could just get him a tutor, I didn’t realise just how significant his disabilities were going to be and at the end of the day he’s still your baby, you just carry on. At the beginning his seizures were quite manageable with the medication but as he got bigger his seizures got worse and harder to control. It became normal for him to have daily seizures so we had a protocol in place where if he had a continued seizure for 10 minutes we’d give him Chloral Hydrate, if he continued for another 10 minutes, we’d give him Paraldehyde, if he continued for another 10 minutes we’d give him Midazolam and then ring an ambulance. We had really good family support and were also involved with a continuing care team who helped. As Ryan got older we had night carers too so we could sleep, because he had to be turned every 2 hours, as he was at risk of bed sores. We have another four children all born after Ryan, in fact one of my children Mia was only 3 weeks old when Ryan passed away. Even though we were told he had a life expectancy of 2 we had also read about David Cameron’s son, who had the same condition, and he lived until the age of 6 so we always had hope. I never really took it in that he was going to die young. If I had dwelled on it I couldn’t have enjoyed life with him, I’d constantly worry about when, how, what, why. The biggest help when Ryan died was Claire House, the children’s hospice. I didn’t want Ryan to go to a mortuary so when he passed away we were able to use a little family room and spend some time with him. They helped us so much and it allowed to spend that time with Ryan and the family. I didn’t have to worry about meals or anything because they didn’t just support us, they supported everyone that came to visit. It just took a lot of the stress away. After Ryan died it was important for his siblings to continue to get support, so they go to a group run by Amy and Friends and it really helps them. They go once a week and get their dinner and play with other children who have been through similar situations. I found after losing Ryan that I lost contact with a lot of my friends, they seemed to withdraw from me. I set up a memorial page on Facebook for Ryan so if people want to see things about him if they want. It’s been 3 years now and you sometimes feel like people think we should be over it by now. Telling people that Ryan died can be a conversation stopper. I find that when someone asks how many children I have and if I say 5 but 1 of them has passed away, they don’t really know how to respond, so that stops the conversation. “Kyle: “I think not a lot of people know how to react, and for more information to be available for friends and family to know how to deal with it. When time goes on, it’s a forgotten thing for people, whereas it’s not for me, I still remember it as if it were yesterday. There needs to be more information. I’ve lost touch with some of my family because they don’t know how to react, they don’t know what to say to me. I had a best friend as well but he’s sort of distanced himself away from me now. I can kind of understand because he has just not had the same experience. I’ve never had any counselling and have not really spoken about it. I avoid the subject altogether, that’s how I deal with it. I wouldn’t know how to start a conversation about it to be honest with you. If someone asked me, I’d tell them and then I’d move on from it, that’s just the way I am. It makes me so angry. You go through all the emotions, anger, whether you’ve done enough, should have done enough, I don’t know. I am lucky to have some great support at work, from two people in particular. They supported me right through it and I don’t know where I’d be without themI have tried to find support but there’s not a lot of stuff round my local area that helps with bereavement. This is a very rare epilepsy syndrome. Seizures start before 3 months of age. Most babies have an underlying structural brain abnormality. This may be genetic in origin (passed on through the genes), or happen because of brain damage before or around the time of birth. If you would like more information aboutOhtahara Syndrome, you can contact Epilepsy Action online at www.epilepsy.org.uk.